Among the 600 species of geckos is the flying gecko (right) which is so named because of a thin fold of skin from the legs to the side, which when extended allows the gecko to glide. The gecko has long fascinated scientists by its uncanny ability to cling to walls and ceiling, seeming to defy gravity. In searching for the gecko’s secret, the feet were studied under 2,000 X magnification to reveal many tiny hairs. But it was not until these hairs were placed under 35,000 X magnification of a phase electron microscope that the thousands of tiny suction cups on the hairs were revealed! While various lizards can lose their tails to avoid being caught (and later grow another), the gecko can actually lose large chunks of skin and regrow it. As long as the body wall is not broken, the lizard heals with minimal scars. 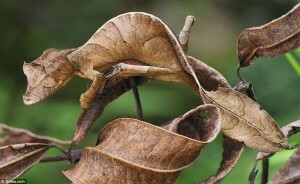 To the left is a species of lizard that lives on the island of Madagascar called the Satanic Leaf-tail Gecko. 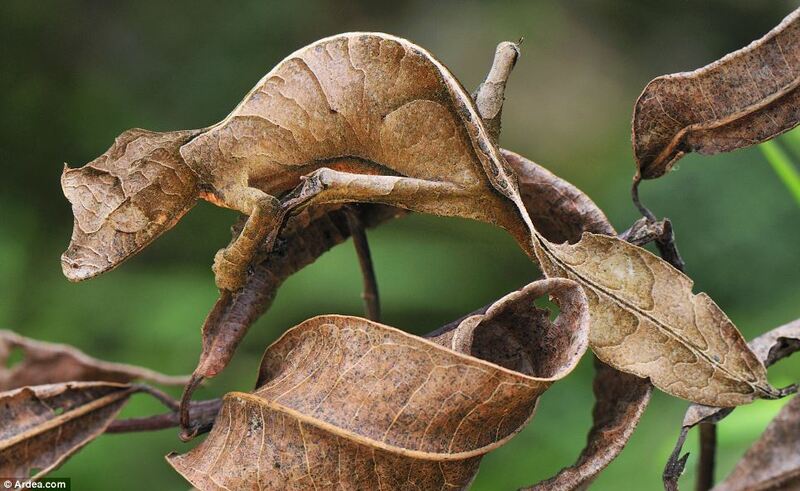 While chameleons might be the most famous camouflaging lizards, this gecko’s tail and uncanny ability to blend among the leaves makes it nearly invisible to predators. Its wide range of skin colors varies from this brown/gray to green with yellow, orange and pink hues. Satanic Leaf-tail Geckos got their name because they look a bit like they have horns and because some specimens have red eyes. 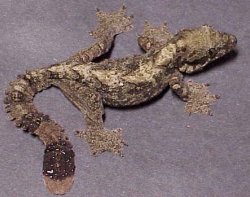 In 2013 a new species of Leaf-tail Gecko was discovered in Queensland, Australia. The Australian gecko Diplodactylus produces a sticky, smelly compound from a gland in its tail which it can then squirt out as far as three feet! In 2015 the BBC reported on a giant gecko species discovered in Papua New Guinea. These geckos grow to several inches long. The Chuckwalla lizard, which lives in the southern United States, has several unique features. These include a blanket of skin that covers its back. In the early morning the skin is dark to attract the sunlight to warm its blood, but as the desert environment gets extremely hot it changes to a beige color and keeps the lizard from overheating. 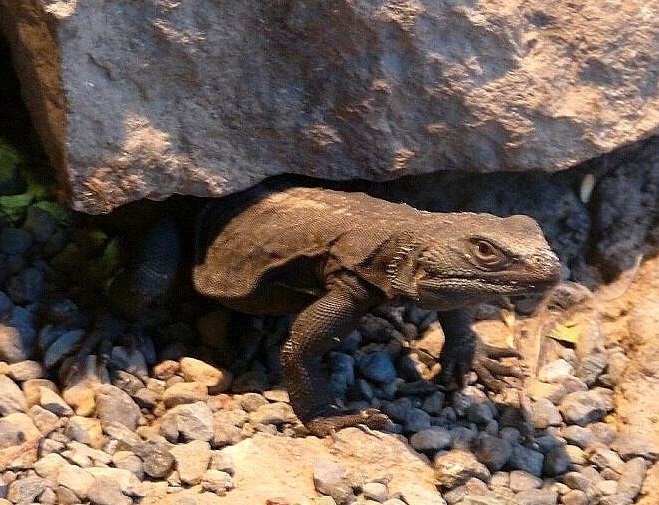 A chuckwalla will scurry away from predators to hide in tight cracks and then “puff” its body out to fill the space and make it nearly impossible to remove. Because the chuckwalla lives in an environment without water, his biological system builds up salt toxicity over time. But there is a special built-in “de-salination plant” at the top of his head by its nose. Before the salt in his bloodstream reaches dangerous levels, the blood is shunted through this system and the salt is removed. From time to time the chuckwalla “sneezes out” pure salt crystals! We should consider some of these bizarre biological systems in common lizards before too quickly passing off curious details in historical accounts involving the ancient dragons (like breathing noxious fumes to paralyze or disorient their enemies). There are multiple living lizards that can spray noxious or toxic chemicals from skin glands on their backs or tails.